Below is an exercise that I have put together from youtube videos to support the AUM vibration as a force within our being to bring accelerated movement toward awakening and into our lives. As well, it establishes a deeper sense of our “I” presence that communes with our Higher Self nature. If you will do it daily with clear intent and purpose, you will begin to move out of stuckness and procrastination. Add to it daily meditation on what you would like to create in life, and you will find you have the impulse to give your ideas the substance of form. The first video is the AUM vibration, and it is suggested that you add the eurythmy movements for “A”, “U”, and “M” as you listen. To understand the importance of eurythmy movement, please click here. It’s important to understand so that the exercise will have more meaning to you. Yogananda describes how the AUM is composed of the creative “A”, the sustaining “U”, and the “M” that dissolves. So in A we have the origin or coming into being’; in U is the creative power to sustain what still has usefulness or meaning; and the M is the power of dissolution that makes way for the new cycle of creation. In life, everything is either coming into being, in full incarnation, or moving out of being–from human being, body organs and cells, and plants… to ideas, organizations, partnerships, etc. With physical senses we observe this as the phenomenon of birth and death, but with imaginative cognition this appears as transformation into something else. Within the AUM–the great vibrational hum underlying all of creation–we discover the forces of the Trinity: “A” is the Father principle of creative thought/idea; “U” is the action of incarnating that thought and pertains to the realm of the Child, who is the incarnated Idea of the Father; and “M” is the birth/death/transformation cycle that takes place within the Great Mother in her womb/domain of Matter. We may bring this great vibration within our being and life with daily practice, and welcome greater movement to ever higher orders of consciousness. The power of the Trinity is within you. Take a few deep breaths and hold for a few moments before exhaling. Now focus on your breath, and become aware of the pauses before inbreath becomes outbreath and vice versa. These are the great gaps of creation. Begin to feel the gap at the height of the inbreath as the creational gap in which you as an “I” being in full conscious awareness establish intention of expression into the world. Feel the gap of the outbreath as the creational gap into which your Higher Self responds to your actual expressions and matches with its inspiration and power through life. Your Higher Self is ‘out there’ as your life. Feel this continual interplay and communication between your “I” and Higher Self becoming more deliberate, intentional, and inspired. Tune into your life, feeling into various aspects of it, and recognize what may need to dissolve to give way to the new, what may need extra sustaining impulses of will, and what is waiting to come into being through you. Take your time, the more you identify and feel into, the more consciously will you be directing the AUM sound and movements into these areas to support transformation. 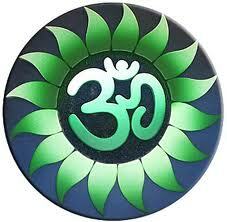 And feel into the immense power of the AUM that is the creative hum of the entire vibrational realm! In this exercise, you are bringing the macrocosmic power of the AUM (Trinity) into your body and your life. Do it with due reverence. When ready, play the AUM video. Standing in a place that is free of clutter, draw an imaginary energy circle in front of you (big enough to stand in). With palms of hands, place all that is in your life that you have tuned into before–all that needs transforming, dissolving, illumination, or a boost of greater energy. “A” – Both arms go up and out to about 60 degrees. The palms are forward. Make the ‘Ah’ sound with the mouth wide open. And take a step back with the right foot (left foot always firmly planted in the energy circle) (see how to step, below) out of the energy circle to make room for new energy to enter. Welcome the creative thought impulses of the Father into your life. “U” – Stepping in with right foot next to the left(placing toes, then arch, then heel), bring the arms parallel, palms facing one another, and move them down until they reach your body. Make the ‘Uh’ sound throughout the movement. “M” when arms are down, bring them up in a circular motion to heart center, palms at heart facing outward. Move palms out away from your body as you take a step forward to the edge of your circle (with right foot, placing toes/arch/heel in that sequence), then move palms back toward your heart center as you bring your right foot back into the circle. Hold palm over palm over the Heart. Make the “M” sound throughout the movement. As you do this, feel that you are first expressing outwardly all that you are incarnating, and on the draw back, feel that you are allowing change and drawing into you the essence of all experience. Repeat the movements in a fluid manner throughout the chanting, with a pause at the Heart (palms one over the other). At the completion of each AUM movement, pause and feel that you have moved to a higher level of conscious awareness. Allow yourself to feel that through the power of the Trinity, you are both co-creator and created in this realm. (The Powell video shows the sound movements too). Now that your body and life are vibrationally humming to the AUM, do the following exercise to awaken the human “I” into which incarnates soul and higher self nature. This video was created by Robert Powell, lecturer, author, eurythmist, and movement therapist. He is founder of the Choreocosmos School of Cosmic and Sacred Dance, and cofounder of the Sophia Foundation of North America. It is a beautiful exercise!